Papa Noel Comes to New Orleans this Christmas! After 100 Years, Historic Coffee Stand Returns to NOLA! Christmas in New Orleans features a wide array of events for travelers, couples and families alike. 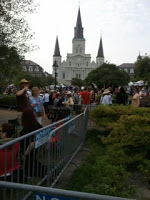 From Reveillon Dinners to Caroling in Jackson Square, there is something here for everyone. Download the Christmas in New Orleans Guidebook to see the entire list of events and activities. We have highlighted a few of the events that we like to experience each year. St. Louis Cathedral in Jackson Square has concerts almost every night of the week, and you can add your voice to the music with the annual Caroling in Jackson Square on December 16. 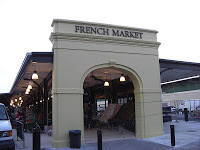 Cooking demonstrations, sponsored by our favorite in-room magazine, Louisiana Cookin, are held at the French Market featuring our great local chefs. Love our architecture? The Preservation Resource Center hosts their annual home tours on December 8 and 9, right in our very own Garden District. This tour is usually a sell-out, so get your tickets and reservations early. French Quarter homes are on tour December 16. Need some last minute gifts or just want to shop around in a fun relaxed setting? Merriment on Magazine, just a 6 block walk from the Grand Victorian, sponsors festive events on the street and in the shops every weekend in December. Reveillon Dinners are a transformed “awakening” of the Creole tradition of dinner after Christmas Eve midnight mass. Many of the city’s finest restaurants offer a chance to get a four course meal at a reasonable price. Don’t forget our Papa Noel rates starting at $165.00 per night plus taxes from December 10-26. We hope to see you under our tree this Christmas season! This entry was posted on Tuesday, November 20th, 2012 at 8:57 pm	and is filed under Area Events, New Orleans. You can follow any responses to this entry through the RSS 2.0 feed. Both comments and pings are currently closed.